1. Heat the oven to 200°C, gas mark 6. Scatter the salad onions, tarragon and garlic in a shallow baking dish. Position the salmon on top, skin-side up, and add the stock. Bake for 15 minutes until the fish is cooked through. 2. Pull away and discard the skin. Roughly flake the fish into pieces. Stir in the celeriac rice and return to the oven for 15 minutes. 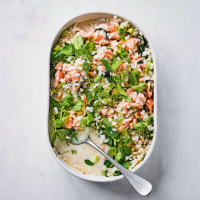 Add the crème fraîche and pea shoots, folding the ingredients into the rice and return to the oven for a few minutes to heat through before serving. Cook’s tip To make celeriac rice, peel half a 1kg celeriac and roughly dice. Pulse in a food processor until the pieces are the size of grains of rice.